Since some of you were curious about Clocky, here is a report on his first day on the job. Clocky got me out of bed at 7 AM this morning. I haven't seen 7 AM in ages. It really isn't the best way to wake up: a huge GASP and a leap and a shot of adrenaline because it is SO loud and so startling. It's just after 9 and I've had my breakfast of steel-cut oats, I've straightened my hair, and I've puttered quite a bit. It is effective! I saw the sunrise. It is terrifying and horribly unpleasant, though. Oreo is traumatized by it. I don't think I could handle having a Clocky without resorting to violence. That sounds terrifying, but if it works... I may have to try it. no no no and no...that thing will never get in my house! I have to admit, though, that the whole thing was HILARIOUS! Clocky is so ridiculous! It scared me so much this morning that I started laughing. I don't think I've ever laughed before 7.30 AM in my life. But please don't report me to the Humane Society for animal cruelty! Oreo would rather put up with a robot clock than go back there! Heheheh how funny! How long until you remove it's batteries?! 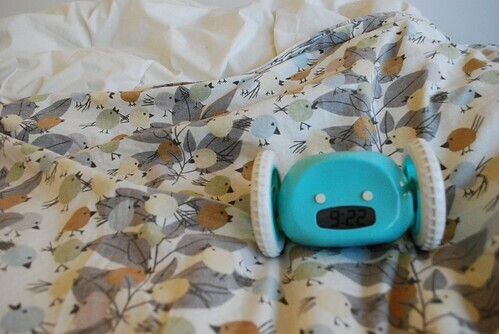 I wonder if you'll learn to tune out Clocky after a few more mornings? I am the worst at getting out of bed too. This morning I hit my snooze for 1.5 hours! Ridiculous! But I am better if I know I have to be somewhere. Yulanda, it would be impossible to tune out. It is so incredibly loud. So loud. It has no volume adjustment. Shortly after Clocky went off this morning, my cell phone alarm went off, and it sounded like the softest chiming of bells in comparison. I got one of these last year. And while I find it the best, most amazing, and also hilarious (i wake up just because im laughing), i still use my clock radio. HA! glad im not the only one who has experienced clocky...love your work! !